ANSWERS INCLUDED. First Days at School has been developed to inspire young children with their imagination but also learn word and math basics at the same time. This book has been styled with the help of a graduate in child teaching who has over 11 years teaching children from age 5 to 12. The word search puzzles have been carefully created with learning in mind for children 5 – 7 years old….words that they will be exposed to at school. Included in the book are some fun maze puzzles that children also like to do and which develop their observation skills. 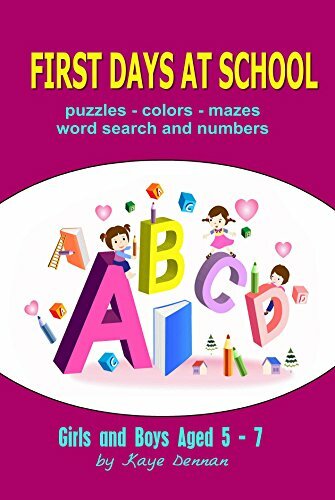 First Days at School is an ideal book for your own children or as a gift for children in the ages of 5 – 7. Children will spend hours working with the books in this series and that is so good for their brain development and intellectual activity.